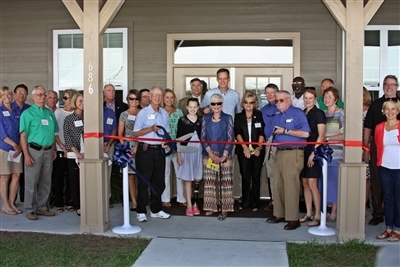 PINETTA – More than 750 people celebrated the opening of the Florida United Methodist Children’s Home’s newest expansion at a dedication service and ribbon-cutting ceremony Tuesday. Florida Conference clergy and lay members involved in developing Madison Youth Ranch, a new residential center for children in need, joined Children’s Home trustees and staff and local community leaders at the site for tours, prayers and fellowship. 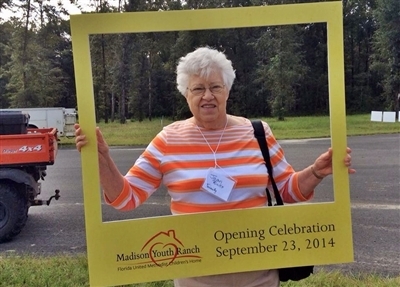 Joan Ricks of Trinity UMC, Gainesville, is among guests welcomed to the dedication of Madison Youth Ranch. Photos from the Florida United Methodist Children's Home. Rev. 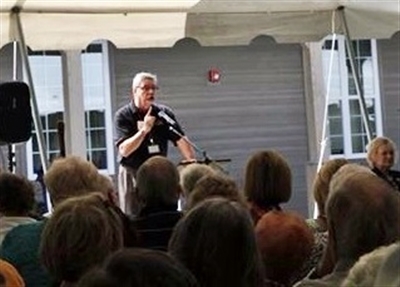 Bob Laidlaw of First UMC, Madison, addresses a crowd at the dedication service for Madison Youth Ranch. Rev. Bob Laidlaw, pastor of First UMC, Madison, and a Children’s Home board member, also spoke at the service. His church will provide youth ministry services to children at the ranch. Donors Billy and Dianne Sullivan and John and Bunny Maultsby also participated, along with Mike Galloway, former chief executive officer of the Children’s Home, and Scott Davidson, a Children’s Home trustee and now interim president of the Florida United Methodist Foundation. Davidson is a former interim president of the Children’s Home who supervised the expansion site’s design and construction. Guests also were treated to a performance by the Madison Boys Choir, a community-based group of young African-Americans. Madison Youth Ranch occupies more than 400 acres of donated land near the Florida-Georgia state line. With its parent campus, based in Volusia County, the new facility will serve children from across the Sunshine State, according to a Children’s Home news release. Referrals to Madison come from local community-based care agencies out of Gainesville, Tallahassee and Jacksonville, as well as from local churches and community groups. Children may also be placed there by their families due to economic hardships, behavioral issues or other problems. The campus began welcoming its first young residents about two months ago and currently houses 12 children, plus house parents. The first phase, now opened, includes two residential buildings that can accept up to 24 children, along with a recreation area and administrative offices. 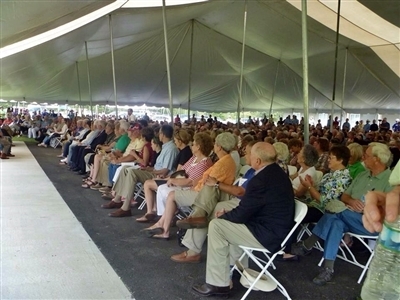 Hundreds gather under a big tent at Madison Youth Ranch as the facility is dedicated to God's service. Key supporters and well-wishers get ready to cut the ribbon on one of the new residential buildings at Madison Youth Ranch. Future growth will be determined by the funds raised to support additional projects, which include more residential homes for children, a horse stable, campus life center, chapel and more. Gibbs said surrounding United Methodist congregations have made fundraising for a chapel there a district priority. “Our district, because (the ranch) is located in the North West District, has really taken it to heart,” Gibbs said. Nearly $300,000, or about two-thirds of the estimated amount needed for a chapel, has been raised, he said. The Children’s Home goal is eventually to serve more than 100 youths ages 6 to 17 in the Madison residential program, with future inclusion of an independent living program and foster care services to the surrounding area. At the ranch, each child has his or her own bedroom and bathroom. Youngsters eat together, share in chores and attend local public schools. Some stay a few weeks, others several years, depending on their family situation. The staff strives for a family-like atmosphere, while also providing therapeutic opportunities. Among goals is to add equine-assisted therapy, which experts say can help children renew self-esteem, learn the value of teamwork and develop healthy relationships and a sense of responsibility. Ruth Moore, community relations director at the ranch, said children housed there got a sneak peek at what that program could be like when some supporters brought horses to the dedication and lingered to let the children have an equine encounter when they returned from school. Though much of the ceremony took place during school hours, the children participated by guiding board members on tours of the new digs the night before, Moore said. They also partook of the same barbecue and refreshments menu served to guests. For more information, visit www.allchildrenfirst.org or contact Mark Nelson, vice president of development at the Children’s Home, at (407) 222-1040 or mark.nelson@fumch.org. -- Susan Green is the managing editor of Florida Conference Connection.